A fun time at Think-Drink-Move! My first Think-Drink-Move with Lori Flynn was a success! Thank you to Finecraft Homes for letting us host this event in one of their beautiful models at Legacy in Carmel. 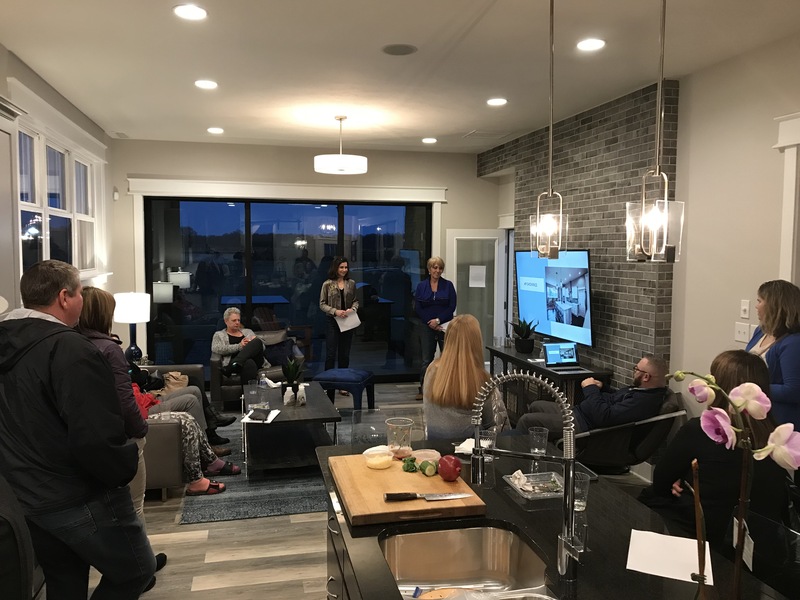 These monthly workshops help have been created to help homeowners and home buyers learn the ins and outs to buying and selling real estate. At Think-Drink-Move not only do you get to see beautiful model homes, but personal chef Chefski is at work in the kitchen, showing us how to make some simple appetizers to wow your guests! 1. Focus on Kitchen and Baths: Keep things simple and clean! White is in for cabinets and counters with splashes of color in the decor. Remove any carpet and wallpaper. Counters should be cleared of all clutter. People want to see the space the kitchen and baths can offer. 2. Flooring: Hardwoods are a hit especially on the ground floor of the home. Be consistent with flooring – buyers don’t like to see different floors in every room. Don’t worry if you have carpet upstairs and in bedrooms. But don’t be afraid to making the transition to hardwood floors while enjoying them before you list to sell. 3. Curb Appeal: How many times do we judge a book by it’s cover? Houses are the same way. If the outside is maintained then most likely the inside will be nice as well. So update your patio with beautiful potted plants, change out the exterior lights and paint the front door! 4. Paint: Not sure what colors to paint your home? Contact me and I will help you make some good neutral decisions that are appealing to the eye and the room. Selling hint: Paint all your woodwork for a bright, clean appearance! These are just 4 of the 10 recommendations we went through at the Think, Drink, Move event. Interested in knowing more selling tips? Contact me! Come join us on March 22, 2018 and March 24, 2018 where we will have fun and discuss the five most common pitfalls for buyers in today’s hot market.